When my daughter was born several years ago, a good friend made us creamy chicken enchiladas after I came home from the hospital and they were wonderful. The recipe calls for tortillas, so I’ve been trying for a while to find a low-carb alternative that tastes as good as the original and I think I’ve finally got it right. My version uses egg crepes in place of tortillas. I don’t wrap up the filling to make proper enchiladas like I would with tortillas, but layering the crepes with the filling makes a nice casserole and it tastes great. To make the crepes, combine the eggs, sour cream, salt, pepper, and garlic powder and mix very well with a whisk or stick blender. Heat a crepe pan, or 8″-10″ frying pan, over medium heat, and when you’re ready to start cooking the crepes, melt a little butter in the pan. Pour a very thin layer of the egg batter in the pan, and tilt the pan to spread it around into a circle. Cook until it’s set, and then flip and cook the other side long enough to brown it a bit. Murphy’s law of crepe-making states that the first crepe will always be a bust. The first picture is direct evidence of this, and the second picture is how they should turn out. Don’t get discouraged if you mess up one or two. Repeat with the rest of the batter, re-buttering the pan as needed. Stir up the batter before pouring each crepe into the pan as the pepper has a tendency to settle in the bottom of the bowl. You can stack the finished crepes on top of each other on a plate as you complete them. If you keep them thin, you should have just enough for the casserole. Once the crepes are done, saute the onions in the pan with a little olive oil. Cook them until they are translucent and soft, and then add the minced garlic and cook for a few more minutes. Combine the onions and garlic with the rest of the filling ingredients and mix well. Spray a 9″x9″ baking dish with non-stick cooking spray. 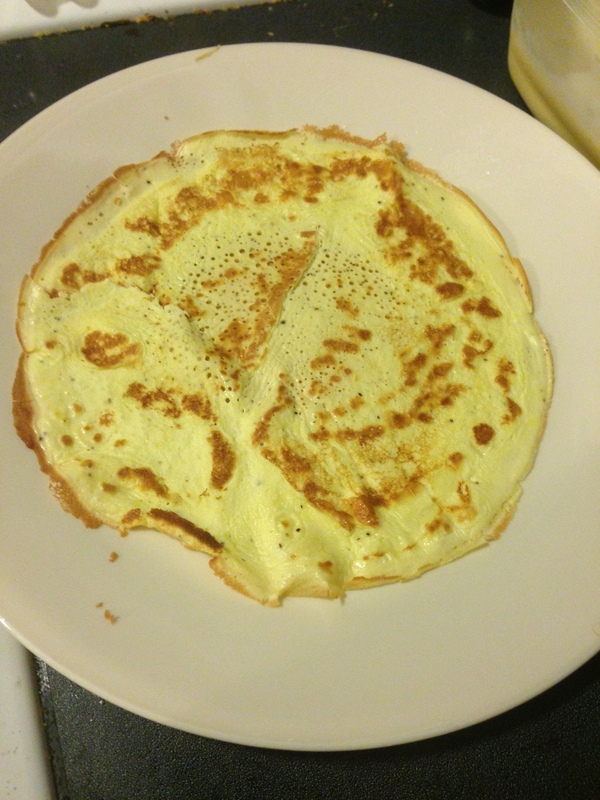 Put down one layer of crepes in the bottom of the dish, cover with some filling, and sprinkle with shredded cheese. Keep layering in this order, and top with a final layer of crepes. Since the crepes are round, and the dish is square, you will have to do some creative arranging. I try to have a different pattern on each layer so that it will hold together better when cutting and serving the casserole. 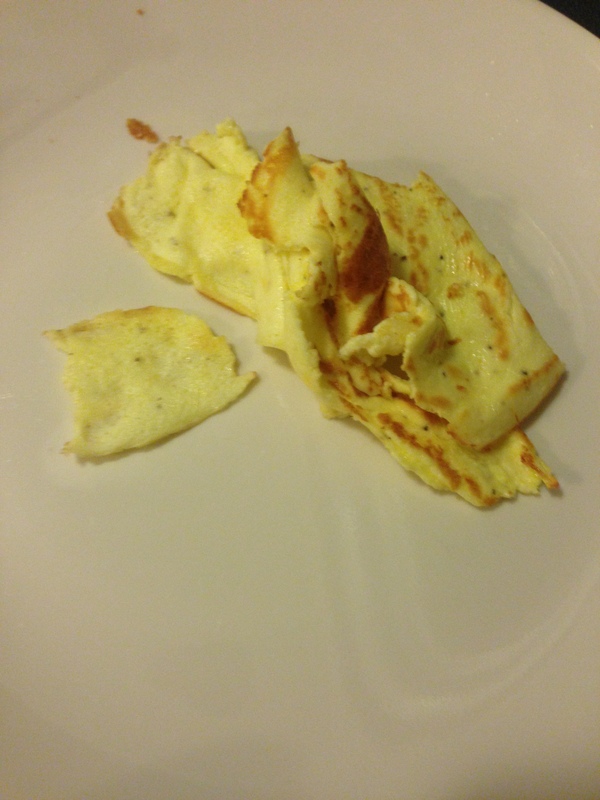 Feel free to cut the crepes in whatever shape you need, and use up the pieces from the inevitable first messed-up crepe. Cover with aluminum foil and bake for 30 minutes at 375º. The casserole should just barely reach the top of a typical Pyrex baking dish, but if your dish is overflowing with goodness, you will want to put it on a tray before putting it into the oven. 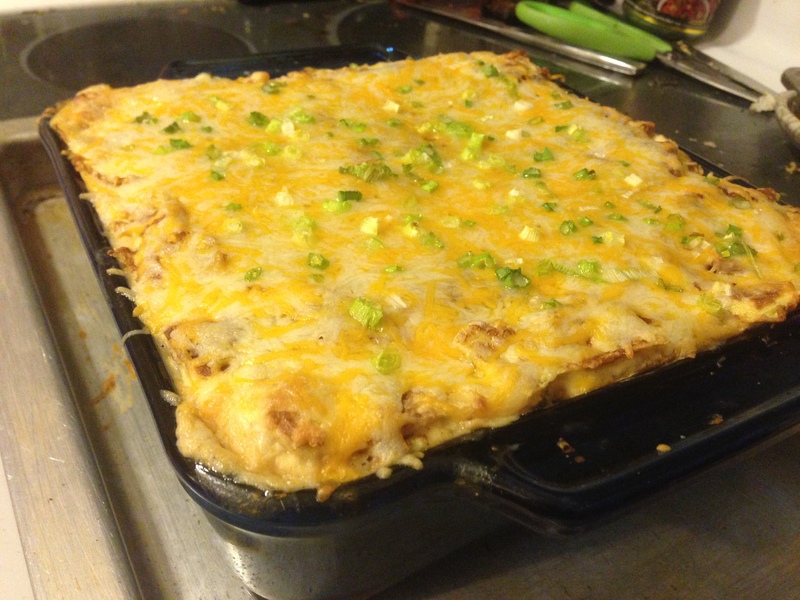 After the 30 minutes is up, remove the foil, cover the casserole with shredded cheese, sprinkle with the green onions, and bake for an additional 5-10 minutes, uncovered, until the cheese is melted. This makes 4 good-sized adult servings.